Sit back and relax as you travel into the amazing Uluru – Kata Tjuta National Park. The scenery along the way will amaze you and with luck, you may even see some of the local wildlife such as dromedary camels, brumbies and kangaroos. 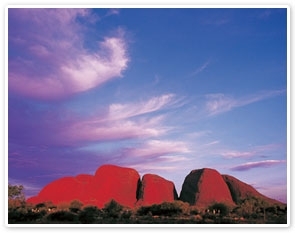 Throughout the journey your experienced Guide will share some history on Kata Tjuta. You’ll hear creation stories passed down by many generations of the Anangu people and learn of the spiritual culture that is everpresent on this land. The depth of your Guide’s knowledge will ensure that this tour is both enjoyable and culturally enlightening. Kata Tjuta simply translated means ‘many heads’ and given the 36 steep-sided domes of Kata Tjuta, it is aptly named. This incredible formation of rock domes extends six kilometres into the ground and is the remains of erosion that began more than 500 million years ago. The area is sacred under Anangu men’s law and under this law, details of many stories of Kata Tjuta cannot be revealed. On arrival at Kata Tjuta you’ll commence the walk to the Valley of the Winds, heading first to the Karu lookout where the scenery is breathtaking. With views across the many domes of Kata Tjuta and out into the sacred Anangu men’s area, you’ll be in awe of this natural wonder. This walk can be a little challenging, but well worth the effort. It takes you down into a haven within the domes through trickling creek beds — a world away from everything and everyone. At times of extreme heat the walk may not be available. Shorter walks are also available for those not wanting to walk to the second lookout. The day just keeps getting better! As the sun sets over the western horizon you’ll arrive at the Sunset Viewing Area. While sipping on chilled sparkling wine you can enjoy all the wonder that is a Kata Tjuta sunset. Each passing minute brings something new as the domes continue to change colour with the setting sun. The Uluru - Kata Tjuta National Park Entry Fee $25 is an additional charge and is valid for 3 consecutive days. It is a compulsory government charge at time of booking and is subject to change without notice. When taking multiple day tours, over 3 consecutive days, you only need to pay the fee once. Children 15 years and under are not required to pay the entry fee. You must carry your ticket with you every time you enter the National Park or you will be required to purchase another ticket. With views across the many domes of Kata Tjuta and out into the sacred Anangu men’s area, you’ll be in awe of this natural wonder. Walk to the Karingana lookout (weather permitting). It takes you down into a haven within the domes through trickling creek beds. Enjoy the wonder of a Kata Tjuta sunset while sipping on complimentary wine.